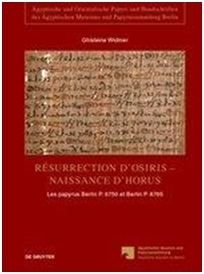 Publikation "Résurrection dOsiris - Naissance dHorus"
Dec. 2016: Publication: Widmer, Ghislaine. Résurrection dOsiris - Naissance dHorus, Les papyrus Berlin P. 6750 et Berlin P. 8765, témoignages de la persistance de la tradition sacerdotale dans le Fayoum à l&slquo;époque romaine, in: Ägyptische und Orientalische Papyri und Handschriften des Ägyptischen Museums und Papyrussammlung Berlin, Band 3, Hrsg. v. Staatliche Museen zu Berlin / Lepper, Verena M.
First complete edition of two demotic manuscripts from the early Roman period. These papyri, written in the distinctive Soknopaiu Nesos hand (Fayyum), are inscribed with religious texts for which only a few parallels are known. Papyrus Berlin P. 6750 contains 10 fragmentary columns and can be described as a compendium of liturgical texts, including among others glorifications, lamentations, litanies of names and hymnic parts. The first seven columns are centred on Osiris, foremost in the West, with the description of his 'resurrection'; the last three columns, which deploy more recent grammar constructions, are concerned with the birth of Horus-the-son-of-Isis inside the mammisi, and his accession to the throne. Papyrus Berlin P. 8765, in its present state, is made up of two large columns containing litanies of names and it is a close parallel to a section of papyrus Berlin P. 6750.? There is reason to think that the main papyrus was written by a scribe from Soknopaiu Nesos in the 1st century A.D. who both compiled earlier sacerdotal texts and composed new ones, combining traditional themes. This enterprise reflects the surge in creativity that can be witnessed throughout Egypt in the religious sphere during the early Roman period.